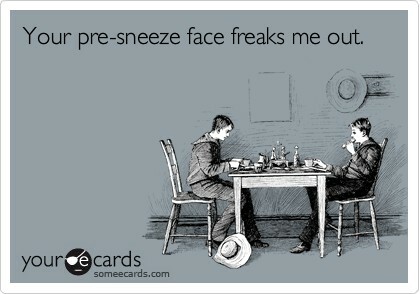 I am a big fan of the hilariously, blunt cards from someecards.com. Usually, I read them and have one of those “hmph”, relatable moments. This one, however, made me laugh out loud… on the couch… by myself! Mainly because I know I make that crazy about-to-sneeze-get-outta-my-way face every single time, especially now during allergy season. Which someecard made you guffaw?